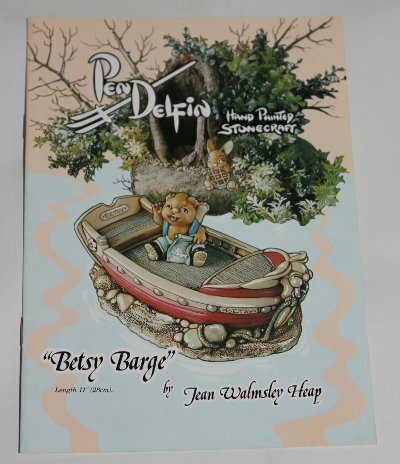 PenDelfin booklet with the PenDelfin Betsy Barge model on the cover. This PenDelfin leaflet opens like a book and has 14 pages of coloured pictures showing some of the PenDelfin models available at the time the brochure was printed. Inside pages feature different PenDelfin scenes with associated rabbits including the PenDelfin Sports Club with Scout, Dobbin & Birdie! One page features the Millennium Exclusive PenDelfin piece, the Nursery designed by Jean Walmsley Heap and pictures Victoria and Toy-Tot alongside! This is a lovely PenDelfin booklet that displays the PenDelfin rabbits and associated display stands really well. Condition: Excellent overall condition. A lovely PenDelfin brochure.